In the 199os an artist-musician and close friend originally from Haiti, Emmanuel Printemps, used to visit us regularly on Friday evenings and we would ask him to share his music with us and our other guests. We always requested one of his most moving, enchanting Creole songs, the powerful but sad story of the local butcher who lost his livelihood during the pig slaughter. As I follow the events in Haiti since the earthquake, I think of these precious friends from another time and place; they and their families are in our hearts and prayers. Rural peasants in Haiti raised a very hardy breed of creole pigs which along with goats, chickens, and cattle served as a savings account. It was argued that from 1978 to 1982 about 1/3 of Haiti’s pigs became infected with the highly contagious African Swine Fever (ASF) in an epidemic that had spread along the Artibonite River shared with the Dominican Republic whose pigs had caught the virus from European sources. At first peasants were encouraged to slaughter their own pigs but then the Haitian government proceeded on a total eradication program that virtually wiped out what remained of the 1.2-million pig population by 1982. Farmers argued that they were not adequately compensated for their losses. The more robust creole pigs were replaced with a sentinel breed of U. S. pigs that were not adapted to Haiti’s ecosystem or market. For Haiti’s rural peasants the loss of income due to the virus and the government’s controversial eradication and repopulation programs led to further impoverishment and greater hardship, ultimately resulting in greater political instability. In two webviral posts entitled “The Hate and the Quake: Rebuilding Haiti” by scholar, historian Sir Hilary Beckles of the University of the West Indies, (Beckles 2010-01-19) that are now circling the globe , we need to do some memory work before we conclude that Haitians are the architects of their own impoverishment. In this seminal retelling of Haiti’s history, (Beckles 2010-01-19) reminds us all that when Haiti provided freedom and the right of citizenship to any person of African descent who arrived on the shores of the newly formed Haitian republic (1805), the newly formed nation-state (1804) was strategically punished by Western countries, through economic isolation ( (Beckles 2010-01-19)). In 1825 in an attempt to be a part of international markets, Haiti entered into negotiations with France which resulted in payment of a reparation fee of 150 million gold francs to be paid to France in return for national recognition. The installments were made from 1825 until 1922. From 1825-1900 alone this amounted to 70% of Haiti’s foreign exchange earnings. Beckles (2010-01-) argues that this merciless exploitation caused the Haitian economy to collapse (Beckles 2010-01-19). Furthermore, when Haiti’s coffee or sugar yields declined, the Haitian government had to borrow money from the United States at double the going interest rate in order to repay their punishing debt to the French government (Beckles 2010-01-19) . From 1915-1934 the United States occupied Haiti under orders of President Woodrow Wilson in response to concerns that Haiti was unable to make its considerable loan payments to American banks to which Haiti was deeply in debt. The brutal U.S. occupation of Haiti caused problems that lasted long after 1934. Beckles, Hilary. 2010-01-19. “The Hate and the Quake: Rebuilding Haiti.” Posted by Sir Hilary Beckles on Jan 19th, 2010 and filed under Caribbean. 1677 G. Mitelli’s “A Baroque “Cabinet of Curiosities.” Lorenzo Legati, Museo Cospiano annesso a quello del famoso Ulisse Aldrovandi e donato alla sua patria dall’illustrissimo Signor Ferdinando Cospi. “One of the first full-fledged demonstrations of this interpretative strategy was Eilean Hooper-Greenhill’s Museums and the Shaping of Knowledge, several times reprinted since its appearance in 1992. “[I]nstead of attempting to find generalisations and unities,” Hooper-Greenhill proposed “to look for differences, for change, and for rupture.”15 This “effective history” as distinct from the “normal history” of progressive development would clear the way to a full appreciation for the array of alternative practices that the old teleological accounts had glossed over or suppressed. On the model of Foucault’s templates of successive formations of power and knowledge (the famous discursive formations-discourse-epistemes), Hooper-Greenhill discussed a succession of sites of collection and display—the Medici Palace in Florence; the Renaissance Wunderkammer or Cabinet of Curiosities (see Fig. 1) the natural history collections of the seventeenth century, particularly the Repository of the Royal Society in England; and the modern “Disciplinary Museum” for which the postrevolutionary Louvre was the prototype. The result is not a connected museum history, let alone a history of “the” museum. It is rather a kind of genealogical chart of the shifting constellations of epistemology and authority governing the collection of material objects” (Starn 2005). 1683 The Ashmolean Museum of Art and Archeology is the UK’s oldest public museum opened. Prior to its opening in 1683, the word “Museum” wasn’t even used in English. 1783 An image depicting the monument to Friedrich II in Kassel’s Friedrichsplatz. The Museum Fridericianum proudly claimed that it was the first museum in Europe. Cassel had galleries, parks, gardens and palaces that imitated the magnificence of Versailles. The Langraves of Hesse-Cassel were dealers in men for centuries. Hessian mercenaries had defeated the agrarian peasants in the area and took their lands. Napoleon III was imprisoned in Cassel, Northern Germany. See Crimp ‘The Art of Exhibition’ (OMR:236). 1828 In his plans for the Berlin Museum, Schinkel preserved the world of classical perfection in his rotunda which was also the visitor’s first encounter with the museum.”The sight of this beautiful and exalted place must create the mood for and make one susceptible to the pleasure of judgement that the building holds in store throughout.” [. . . ] “First delight, then instruct.” This sanctuary as Schinkel called it, would contain the prize works of monumental classical sculpture mounted on high pedestals. This was to have the effect of preparing the visitor for a “march through the history of man’s striving for Absolute Spirit. Schinkel planned a gestalt in which all relationships among objects were fixed. He paid close attention to Hegel’s notion of aesthetics as they were elaborated in his lectures from 1823-29. Hegel declared that, “The spirit of our world todat appears beyond the stage at which art is the supreme mode of our knowledge of the Absolute. The peculiar nature of artistic production and of works of art no longer fulfills our highest need. We have got beyond venerating works of art as divine and worshipping them. The impression they make on us needs a higher touchstone and a different test. Thought and reflection have spread their wings over fine art.” (Hegel, Introduction to Aesthetics). Hegel was speaking of the Owl of Minerva which was to be exhibited in the museum’s rotunda. The Owl of Minerva prepares the viewer for a contemplation of art which “has lost for us genuine truth and life, and has rather been transferred into our ideas instead of maintaining its earlier necessity in reality . . . Art invites us to intellectual consideration, and that not for the purpose of creating art again, but for knowing philosophically what art is.” Crimp continues, “It is upon this wresting of art from its necessity in reality that idealist aesthetics and the ideal museum are founded; and it is against the power of their legacy that we must still struggle for a materialist aesthetics and a materialist art (Crimp 1993:302). 1845 P. T. Barnum’s Grand Colossal Museum and Greatest Show on Earth (Boon 1991:259). 1851 Crystal Palace Exhibition was one of the first great world fair’s which were a great nationalistic invention in the 19th century based on the theme of European’s progress (Errington 1998:18 ). Colonized peoples were represented as sources of raw materials. The disciplines of folklore and archaeology were used for nationalistic purposes. The Crystal Palace unintentionally represented Britain’s colonial transgressions (Boon 1991:259). The world’s fair, the museum of science and technology, the fine arts museum, the natural history museum are examples of public sites for mass education in the idea of progress (Errington 1998:19). 1861 Edward Belcher wrote an paper entitled ‘On the manufacture of works of art by the Esquimaux’ which is archived in the Department of Ethnography in the British Museum in London. See J. King Franks and Ethnography. This may be the first paper written on Inuit art (Belcher 1861). 1892 Henry James (1892) described Venice as a beautiful tomb, a museum city with its gondoliers, beggars and models as custodians and ushers and objects of the great museum. (James, Henry. 1988. Henry James on Italy [Selections from Italian Hours] New York: Weidenfeld and Nicolson, 1988:10 cited in Boon 1991:255). Crimp (IMR 1993:109) referred to a ghost tale by Henry James which played on the double, antithetical meaning of the word presence. “The presence before him was a presence.” In his ghost stories James uses a notion of presence as a ghost that is really an absence. It refers to a presence which is not there. Crimp added the idea of a presence as a kind of increment of being there. It is a ghostly presence that is its excess of presence even when the person conjured is absent. Crimp compared this to Laurie Anderson’s presence at Documenta 7 (1982) in Cassel as an uninvited but powerfully present contemporary artist. 1893 Boas has collected data for this book while gathering ethnographic material in preparation for the 1893 World’s Columbian Exposition which he hoped would be a potential for public education about other cultures through the use of culturally sensitive and intelligent ethnographic displays. Boas, a Jew devoted his life to dismantling racist notions that had impregnated the social sciences in the 19th century. He was so disgusted by the final displays of human culture in the world fairs that he refused any further collaboration. At the 1893 Chicago World’s Fair Inuit wore their fur clothing in the heat of Chicago summers. They demonstrated the art of snapping whips and exhibited their kayaks. Franz Boas’ (1858-1942) book entitled The Central Eskimo was reprinted. Boas has been called the father of American Anthropology. Boas promoted the concept of cultural determinism. His students including Margaret Mead founded university departments and/or directed museums of ethnography. See also The World as Marketplace: Commodification of the Exotic at the World’s Colombian Exposition, Chicago (Hinsley 1991) Columbia Exposition was the origin of the Chicago Museum of Science and Industry (Errington 1998:20). 1904 Exposition in St. Louis displayed Philippine natives. The US had recently annexed the Philippines. 1905 Franz Boas resigned after ten years with the American Museum of Natural History because he was convinced that it was impossible to adequately represent cultural meaning on so slim a basis as physical objects. (8 ) He turned his attention to analysis of oral traditions, hoping to find in texts recorded directly from native speakers a more objective method of addressing the issues preoccupying the anthropology of his day — race, language, and culture. (9) Some of his followers, though, continued to argue for the superior objectivity of material culture; Alfred Kroeber, for instance, saw archaeological data as ‘the purest [data] there are.’ (10) This penchant for trying to abstract evidence about ‘traditional’ culture from embodied words and things, while ignoring the turmoil engulfing Native peoples at the time collections were made, has retrospectively been interpreted as a serious shortcoming of early anthropology, but it established patterns. “In the short history of anthropology, analyses of spoken words and of material objects have usually been compartmentalized. In North America this dichotomy reflects the way the discipline was originally constituted. 1910 National Gallery of Canada Collection moved to east wing of the Victoria Memorial Museum building. 1923-42 Frederick Keppel was the president of powerful Carnegie Corporation. At that the Corporation were interested in creating elitist consensus building and in cultural development in places like Australia. The Corporation’s ideals, values, prejudices, interests and assumptions tended to support business-orientated, white, Anglo-Saxon Protestant men (Lagemann 1989:6-8,104). Keppel’s aim was to the transmission of “traditionally elite culture…[through]… enlightening public taste directly”. In regard to the arts it was clear that “the goal was to elevate the “best taste” rather than “improve the average”. Under Keppel, classical styles in the fine arts, great literature and the sensibilities and habits associated with them, were seen as “essential to character and taste especially as culture became more susceptible to commercial standards and interests”. Keppel’s goal was to be achieved, not just through schools, but also via the diverting of popular interest in education to agencies like the library, adult education center and the art museum. E. Root (president of the Carnegie Corporation until 1932) echoed 1920 sentiment, when he directed that Corporation policy would follow the trend “for art education and art appreciation… to unite all of the arts in the common endeavor to educate the publics tastes and to train men and women who may interpret the arts to the body of the people” (Lagemann 1989:95,102,115,117). 1923 Le Corbusier held up an image of a pipe as an image of pure functionalism. See Foucault (OT 1982:60) See Magritte (1926). 1926 Réné Magritte (1898-1967) entitled a painting Ceci n’est pas une pipe. See Foucault (1973). 1930 Canadian Handicrafts Guild organized an exhibition of Eskimo Arts and Crafts at the McCord Museum in Montreal. The exhibition attracted the attention of the New York Times (Canadian Guild of Crafts Quebec 1980:11). 1936 Walter Benjamin wrote his influential essay “The Work of Art in the Age of Mechanical Reproduction,” (1936) the aura is the source of all value in a deteriorating world. Aura as used by Walter Benjamin refers to “the associations which, at home in the mémoire involuntaire, tend to cluster around the object of a perception”(186). Its place in memory reveals that the aura is what has made the objects of the collector, the translator and the storyteller seem so meaningful “Once you have approached the mountains of cases in order to mine the books from them…what memories crowd in on you!”(66), he writes of his collection. He connects storytelling explicitly to memory. “Memory is the epic faculty par excellence”(97) and even employs the term “aura”. The storyteller is the man who could let the wick of his life be consumed completely by the gentle flame of his story. This is the basis of the incomparable aura about the storyteller….The storyteller is the figure in which the righteous man encounters himself (108-9). The aura is elsewhere defined in these telling terms. Experience of the aura thus rests on the transportation of a response common in human relationships to the relationship between the inanimate or natural object and man….To perceive the aura of an object we look at means to invest it with the ability to look at us in return. This experience corresponds to the data of the mémoire involontaire (188 ). As one can see, before the essay “The Work of Art in the Age of Mechanical Reproduction,” (1936) the aura is the source of all value in a deteriorating world. It grounds the practice of the collector, the storyteller and indirectly the translator for it lends to their activities a purposefulness they would otherwise not have, becoming only allegories of market strategies. It makes sense that he would have to declare war on this concept given the way those activities resemble market strategies even with their aura__ given, in fact, the resemblance of aura to ideology. Experience of the aura thus rests on the transportation of a response common in human relationships to the relationship between the inanimate or natural object and man….To perceive the aura of an object we look at means to invest it with the ability to look at us in return. This experience corresponds to the data of the mémoire involontaire (188 ). Crimp (OMR 1993:112) argued that art history adopts an approach modeled on kunstwissenschaft wherein art historians attempt to prove or disprove the aura or presence of the authentic, unique original aspects of works of art. Using chemical analysis or connoisseurship art historians can prove or disprove the authenticity of a work of art which assures its place in a museum. Museums reject copies and reproductions. The presence of the artist must be detected through the work of art or the claim of authenticity cannot be made. See Crimp (OMR 1993:112). 1941 The Museum of Modern Art in New York “staged a major exhibition called “Indian Art in the United States”, a seminal show which demonstrated that scholars and curators had recognised the unstoppable force of a key area of aesthetics and felt obliged to say: “Yes, we recognise this art, these artifacts, for the divinely inspired wonders which they often are.” One man who summed up what the American public was seeing, in many cases for the first time, was the ethnographer and anthropologist Claude Lévi-Strauss. “Before long,” he noted, “these works will appear in museums and galleries of fine art.” (Hensall 1999) See 1999 “The Back Half – Visions of another America” The New Statesman. 1941 The exhibition entitled the “Art of Australia” traveled to the Museum of Modern Art (MOMA) in New York and the National Gallery of Art Washington and the National Gallery of Canada in Ottawa. The exhibition in Canada displayed different works of art than those shown in the US. The MoMA and the US National Gallery of Art were considered to be the most significant. Canada is a commonwealth country whose civic structure and population size is roughly similar to Australia’s. “These three venues set the parameters and context of the exhibition as a public event, configuring the show in a sequence of events in a bigger cultural picture that reveals the relationship of alliances that exists between governments and the deployment of culture as a tool of propaganda (Ryan, Louise 2002)”. 1947 André Malraux introduced his notion of the musée imaginaire or Museum Without Walls. “In his well known Museum Without Walls of 1947, André Malraux commented on the “fictitious” aspect of art books and observed that reproductions not only change the scale of original works, they also make them lose any sense of relative proportion when gathered together in such a way. Enlarged details, lighting, angle of shots, colour, everything metamorphoses the works. Furthermore, reproduction can bring side by side works of art that could never be seen together simply because they are housed in various institutions or scattered in different locations, indoors and outdoors, all over the world. The end result for Malraux was nothing less than an “imaginary museum”, an ideal art museum, as opposed to a real one, one that transformed the way art was experienced, appreciated and understood” (Malraux, 1956). 1949 In his 1949 publication La Méditerranée et le monde méditerranéen à l’époque de Philippe II, Fernard Braudel irreversibly transformed the way history was written. The social science turn in historiography was propelled forward by Braudel’s methodology based on “la longue durée”. Braudel examined white writings on the surface of the profound oceans to explore societies in relation to their geographic environments, social structures, their trade routes and their intellectual histories. Braudel examined the geography, political economies and sociology of the cities, Venice, Milan, Genoa and Florence in the age of Phillip II. Images of the immobility of time in Borges map contrast with the rapid acceleration of time in traditional history where centuries and millenia were encapsulated into the lives of singular heroic figures from Alexander the Great, Caesar, Gengis Khan, Louis XIV to Napoleon (Braudel 1949). 1950s Whitney committed to MoMA orthodoxy-the preference for European modernism. Prior to 1950s the Whitney was committed to realist art. The Metropolitan Museum of Art (MoMA) was considered to be an elitist, right of center museum dedicated to exhibiting the aesthetic tastes of the New York establishment. 1953 James Houston met with his friend Eugene Power to discuss ways of marketing Inuit Art in the United States. Power, who owned and operated University Microfilms in Ann Arbor, established a non-profit gallery in Ann Arbor called Eskimo Art Incorporated to import the work. He encouraged the Cranbrook Institute of Science to host an exhibition of the work in 1953, the first exhibition of Inuit Art in the United States. In 2004 The Dennos Museum Center holds a collection of nearly 1,000 works of Inuit art from the Canadian Arctic. It is believed to be one of the largest and most historically complete collection of Inuit sculpture and prints in the United States. James Houston visited New York and Chicago to sell Inuit carvings and talk about their experience in the Canadian Arctic. Houston’s friend Eugene B. Power at the university at Ann Arbour, Michigan invited some colleagues including museum director Dr. Robert Hatt and anthropologist Bruce Inverarity, who began collecting Inuit art. Power began Eskimo Art, Inc Power’s foundation Eskimo Art Inc offered to purchase the entire Guild inventory of Inuit art although the Guild declined the offer. Guild president Jack Molson had informed James Houston that even though the quality of the works was improving the Guild did not have a large enough clientele to sell the work. Eskimo Art Inc later helped organize exhibitions of Inuit art including a travelling exhibition organized by the Smithsonian Institute in Washington. Houston described other early exhibitions at the Field Museum in Chicago and at the Museum of Natural History in New York. There were exhibitions in the States before Canadian galleries noticed (Houston 1995:146-8 ). 1960 Michael Spock director of the Boston Children’s Museum adopted a missionary zeal in development and implementation of hands-on visitor-centred learning experiences in museum display. Based on his own learning experience as a dyslexic in a well-known and politically liberal family, Spock focused on a concept of aesthetics which was linked to comfort in learning. He used interactive materials in the museum space prior to developing the exhibition to ask viewers what they wanted to know about the exhibition content. He and Oppenheimer were among the pioneers in hands-on museum display (Gurian 1991:180 in Karp and Levine). 1960s Photography was ‘discovered’ as an art form. Robert Rauschenberg and Andy Warhol began to silkscreen photographic images onto the canvases. Through this process photography contaminated the purity of modernism’s separate categories of painting and sculpture. See Crimp, (On the Museums Ruins 1993:77). 1964 The artist Marcel Broodthaers held an exhibition at the Galerie Saint-Laurent in Brussels. He explained that until that time he had been good for nothing so he decided to try to create. His admission of bad faith, of the commodization of art, made of him a creator of ‘museum fictions’. “Fiction enables us to grasp reality and at the same time that which is veiled by reality.” See Crimp (1993:201). 1965 Ian Smith, the Prime Minister of Rhodesia (now Zimbabwe) signed the Declaration of Independence. Museums in Rhodesia reflected the anti-black stance of the government. Africans were discouraged from patronizing museums. The cultural heritage of Africans of Zimbabwe was very rich. Material culture included numerous objects that were aesthetic, sophisticated, innovatice, original and ingenious. Artifacts were collected by third parties, such as farmers, missionaries. These collections were then acquired by museums so that there was no relationship between the ethnographer and the object. The original environment and social context of the object were of no interest to the museum since their was no value assigned to the entire culture of Africans of Zimbabwe. A policy of centralization of research collections was adopted and implemented between 1979 and 1981. No African traditions of Zimbabwe were collected in the archives until 1977. They had clearly set up museums as white culture houses. When Robert Mugabe, first black prime minister of Zimbabwe first came to power in 1981? he called for a reconciliation of the political, economic, cultural identities of Zimbabwe. Cultural institutions through collections and galleries are the central artery of communication as providers of education and information. Some argued that cultural institutions in Rhodesia, like museums, were a European concept that could not be adapted to the needs of a pluralistic society like Zimbabwe. See Munjeri in Karp and Lavine. 1967 Federal and provincial governments built historical parks. Students wore period costumes and took on roles of their forefathers as a summer job. Canadians were learning to be proud of being Canadian. Tourism was on the rise. 1968 But in Krauss’ narrative, by the late 1960s video and television were rendering film obsolete; Broodthaers’ Musee d’Art Moderne signaled a loss of confidence in medium in retooling the readymade to embrace the entirety of commercial dross. In so doing Broodthaers further registered the classifying and collecting functions of the museum as a practice heading toward obsolescence See EndNote entry under Krauss (1999). 1970 Museum workers including Leah Inutiq, at the newly founded institution Nunatta Sunaqutangit organised an exhibition of Inuit Art during the Royal Visit to Frobisher Bay, NWT. 1970s According to d’Anglure (2002:227) new generation of educated Inuit, including the founders of Igloolik Isuma like Paul Apak and political leader Paul Quassa, began to visit archives, museums and libraries to learn more about the past and about shamanism. Research into the past intensified along with negotiations for Nunavut and self-government. (D’Anglure 2002:227). 1970 Minimalist artist Richard Serra moved his work outside museum walls by building Spiral Jetty in the Great Salt Lake in Utah. 1971 Doris Shadbolt was one of the curators of the exhibition “Sculpture of the Inuit: Masterworks of the Canadian Arctic” which opened at the Vancouver Art Gallery. 1971 The Multiculturalism Policy and its attendant Canadian Multicultural Act were adopted. “The federal multicultural program formalised support for the idea of Canadian identity as constituted in its diversity of cultures, an idea that was only implicit in Massey-Lévesque. Multicultural diversity was designed to be the basis of the cultural pillar of Canada’s foreign and domestic policy. In many ways, its logic is the inverse of Massey-Lévesque. The aim of Massey-Lévesque was about building institutions that would unify a compartmentalised nation and about underlining Canada’s historical roots in Europe, primarily Britain and France, as a means to deflect Canadians from the pernicious influences of American culture.” See Ken Lum (1999). 1971 Duncan Cameron published his article distinguishing between the museum that plays a timeless, universal functions as a structured sample of reality, an objective model of reality (Cameron 1971:201. The museum as forum is a place for confrontation, experimentation and debate (Cameron 1971:197 cited in Karp 1991:3).” “In 1971 the Canadian museologist Duncan F. Cameron pointed out the museum’s need to develop both the functions as a temple and as a forum. Twenty years later he once more offers a critical analysis of the museum and the museum profession. Cameron still thinks the museum profession can form part of the vanguard for positive social change. One of the biggest problems, he finds in the conflicting values within the individual, who is constituted as an unholy trinity of private, professional and institutional persons. Each professional person will have to re-examine himself, the academic disciplines and the museum institution. To meet the challenges of tomorrow it is necessary with a change of heart, not only intellectualism.” (Gjestrum 1994). 1974 The Museum of Modern Art held a controversial exhibition entitled ‘Eight Contemporary Artists’ including the highly politicized Conceptual and Minimalist work. Minimalist artist and museum critic Daniel Buren cynically argued that works of art might as well be locked up in vaults to protect them since they are already so isolated from the world framed, encased in glass in museums. Burin’s contribution to the exhibition was striped panels and fragments representing these frames affixed to nearby corridor and garden walls. Vogue magazine’s Barbara Rose vented her anger against this complicity between the dominant bourgeois cultural institutions and politically-motivated critics of these institutions. She argued that artists like Buren were disenchanted and demoralized artists who sabotaged museums of prestigious museums like the MoMA. focused their aggression against art greater than their own. See Crimp (Museum Ruins:85). 1970s Museology became more professional as money increased. Their staff’s professional credentials trumped experienced volunteers. 1975 The Museum of Modern Art exhibition entitled Modern masters, Manet to Matisse was an unprecedented success when it was shown in New York August 5-September 28 and later in Australia. See exhibition catalogue: Lieberman, William S. Ed. 1975. Modern masters, Manet to Matisse. Museum of Modern Art, New York. This international exhibition which included mainly works on loan from international collections and attracted a wide audience including those who did not usually visit museums, heralded the age of the blockbuster (blockbuster era) in art museums in particular and museums in general. 1975 MoMA’s Modern Masters: Manet to Matisse was the first blockbuster art exhibition in Australia. John Stringer who worked at MoMA in the 1970’s was at least partly responsible for bringing this exhibition to Australia. 1977 Michel Foucault’s 1977 essay “Nietzsche, Genealogy, History” provides his most programmatic and most influential statement on the genealogical method is the essay. See Starn (2005). 1978 President Carter established a commission, chaired by professional “survivor” Elie Wiesel, to create a national museum in Washington memorializing Jewish suffering in Europe (Finkelstein 2000). 1979 U’mista Cultural Centre is located in Alert Bay on Cormorant Island near the northern tip of Vancouver Island. It adjoins the former residential school, St. Michael’s Residential School. The objects now on display U’mista Cultural Centre and the Kwagiulth Museum and Cultural Centre (opened 1979) were part of major 1921 potlatch hosted by Dan Cranmer from Alert Bay. Potlatch ceremony was criminalized against harsh criticism by Franz Boas. These objects were all confiscated by the Indian agent at Alert Bay, William Halliday who was a ‘former Indian residential school administrator imbued with civilizing zeal’. In the 1950s and 1960s there was a general cultural resurgence. The movement for repatriation emerged. The Museum of Man in Hull (now the Canadian Museum of Civilization) and the Royal Ontario Museum agreed to their repatriation. At this time the two museums were built with private and government funding. Objects in these museums have an evocative power that includes a sense of ‘here’ as well as formal, aesthetic power. See James Clifford in (Karp and Lavine). 1980s Marcel Broodthaers’ controversial work led to a series of publications including a special edition of the journal October (1987) devoted to his role in the unsettling the role of museums. Broodthaers registered the classifying and collecting functions of the museum as a practice heading toward obsolescence See EndNote entry under Krauss (1999). 1982 Hans Haake participated in the Documenta 7 exhibition which was held at the Museum Fridericianum in Germany. Haake Oelgemaelde, Homage a Marcel Broodthaers in the Neue Gallery not in the Museum Fridericianum. His work was confrontational. On one wall was a detailed oil painting of Ronald Reagan which was in a gold frame and surrounded by classical museological framing devices. On the other was a gigantic photomural of a peaceful anti-Reagan demonstration protesting the deployment of cruise missiles to German soil held in Bonn a week prior . Artistic Director Rudi Fuchs presented a contradictory image. See Crimp (MR:238-9). 1984 The Metropolitan Museum of Modern Art, New York hosted an exhibition entitled Primitivism in 20th Century Art which juxtaposed modern artworks with masks from Zaire, Nigeria and Inuit masks. McEvilley (1984) criticized the premise of the exhibition and inaugurated debates on representation of culture. Danto (1987) argued that the juxtapositioning was false and inane. The Museum of Modern Art held an exhibition entitled “Primitivism in 20th Century Art” which was attacked by critic Thomas McEvilley, who called for a rejection of Eurocentricism in cultural history. This opened debates on representation of cultures with a more sophisticated approach to discussions of Self and the Other that continued throughout the 1980s. 1984 The Maori exhibition at the Metropolitan Museum created tensions over ethnohistorical exhibitions. The ethnological and historical background material was rejected as nonsensical by the Maori elders revealing how deeply marginalized groups want to ‘define their own heritage’ and launching debates about institutional procedures (Lavine and Karp 1991:2). 1984 The MOMA held an exhibition in 1984 entitled “An International Survey of Recent Painting and Sculpture, in which curator McShine excluded many important artists. AT&T Corporation sponsored the exhibition. Their interests were in accord with the exhibition’s. Innovation and experimentation were valued in business, industry and the arts. One of the new acquisitions of the Architecture and Design Galleries at the MOMA was a Bell 47D helicopter which was considered to be a coup de théatre. These helicopters are manufactured by the same corporation Textron, that builds the Huey model used against civilians in El Salvador, Honduras and Guatemala. “Contemporary art of exhibition has taught us distinguish between the political and the aesthetic. A New York Times editorial described how, “A helicopter suspended from the ceiling, hovers over an escalator in the Museum of Modern Art . . . . The chopper is bright green, bug-eyed and beautiful. We know that it is beautiful because MoMA showed us the way to look at the 20th century.” See Crimp (1993:272-5). 1987 The exhibition catalogue (1987) was published for The Spirit Sings, an ethnographic exhibition of 106 artifacts sponsored by Shell Canada. The exhibition included cultural productions of the Tlinglit, Salish, Haida, Tsimshian (including the mate of the famous Musee de l’Homme prehistoric mask), Gitksan, Iglulik, Netsilik, Mackenzie Inuit, Copper Inuit, Qairnirmiut, Caribou Inuit, Sadliermiut, Southern Baffin, Labrador Inuit, Slavey, Kutchin, Athapaskan, Tahltan, Cree, Chipewyan, Tanaina, Ojibwa, Assiniboin, Sioux, Plains Cree, Blood, Blackfoot, Sarsi, Red River Metis, Late Missippian, Ottawa, Cayuga, Iroquois, Huron, Woodlands, Mohawk, Montagnais (Innu? ), Naskapi, Micmac, Maliseet and Boethuk spanning centuries. The goal of this exhibition was to enhance understanding and appreciation of ‘the spirit of Canada’s Native peoples. It was dedicated to the ‘people who produced the objects included in the exhibition. Eighty-five institutions loaned works for the exhibition which was shown at the Glenbow Museum in Calgary and the Lorne Building in Ottawa. The voluminous preparatory research undertaken by a team of anthropologists and ethnographers produced a vast archives of slides and text that remains as an invaluable lasting resource for all researchers. In her Introduction Harrison (Harrison 1987:7) grouped together all the native populations in Canada at the time of contact suggesting a unified and unifying pan-Aboriginal world-view informed by myths and legends. 1987 In his publication Museums of Influence, Kenneth Hudson described how he had visited 37 museums that made significant changes in the 200 years of museology. He dismissed ethnographic museums as those that exhibited objects from exotic cultures without attempting to communicate essentials features of the societies more easily conveyed through film, video or even lectures. He laments the absence of ambitions, fears, poverty, disease, climate, cruelty, brutality, blood, sense, smell and therefore cohesion to the exhibits. “Ethnographical museums collect widely but do not dig deeply” (Hudson 1987:vii) Cambridge: Cambridge University Press. 1988 Marybelle Mitchell wrote an article entitled “Current Issues Facing Museums” published in the Inuit Art Quarterly. In 1988 200 delegates met. 1988 Clifford went on to give a powerful example from a museum. The Portland Museum of Art houses the Rasmussen Collection, a series of masks, [end of page 98] headdresses, and other objects collected from southeastern Alaska during the 1920s. When the museum made plans to reinstall and reinterpret the collection in the late 1980s, it decided to involve Tlingit elders as consultants from early stages. A dozen prominent elders, representing clans that originally owned the objects, were invited to travel to Portland, Oregon. During a planning session at the museum, objects were brought out, and elders were asked to speak about them. Clifford describes how he and the curatorial staff, focusing on the objects, waited expectantly for some sort of detailed explication about how each object functioned, who made it, what powers it had within Tlingit society. Instead, he reports, the object acted as memory aids for the telling of elaborate stories and the singing of many songs. As these stories and songs were performed, they took on additional meanings. An octopus headdress, for example, evoked narratives reaching about a giant octopus that once blocked a bay, preventing salmon from state and federal agencies regulating the right of Tlingits to take salmon, so what was started as a traditional story took on precise political meanings in terms of contemporary struggles. “And in some sense the physical objects, at least as I saw it, were left at the margin. What really took center stage were the stories and songs.” (1) From Julie’s Cruikshank The Social Life of Stories: Narrative and Knowledge in the Yukon Territory. 1989 In 1989, “the editors of the first book on history museums in the United States complained about a “blanket of critical silence” surrounding the subject. In 1992, the British museum specialist Eilean Hooper-Greenhill observed that the museum as a historical institution had not received “any rigorous form of critical analysis.” Other scholars and critics chimed in around the same time.1 As it happened, a tidal wave of museum studies was just beginning to crest, many proclaiming critical agendas while complaining about their absence. The problem these days is how to navigate a flood of literature on the theory, practice, politics, and history of museums” (Starns 2005). 1989-90 Dr. Jeanne Cannizzo curated an exhibition mounted by the Royal Ontario Museum entitled “Into the Heart of Africa.” It was the most controversial show in the history of the ROM. A vocal opposition arose against cultural racism and appropriation. Cannizzo stated that the goal of the exhibition was to represent the impact of colonialism on Africa. However the 375 artifacts from central and west Africa used were donated around 1889 and onwards to the ROM by Canadian missionaries and military personnel who spent some time in Africa and fully supported Britain’s colonial campaign which imposed “Christianity, civilization and commerce” on Africans. Cannizzo misread her audiences and attempted to use the postmodern trope of irony to draw attention to racist terms such as ‘barbarous customs.’ In fact there were at least two divergent audiences. A misinformed general public read the exhibition as a uncritical cultural exhibition of primitive Africa and the good work of Canadian missionaries and soldiers. The large African-Canadian population of Toronto interpreted the exhibition as a racist assault. A slide show lecture containing highly derogatory, culturally racist, and paternalistic language played framed with a critical introduction and conclusion to situate viewers within the racist colonial context. But most people read it as ‘real’ without the critical postmodern lens of irony. Tour guides had no training in colonial histories or cultural sensitivities and presented the exhibition literally without understanding the critical ironic trope. The guide explained to Grade five children how missionaries taught Africans to carve wood and described African barbaric acts. “This case study crystallizes many of the issues related to cultural racism and cultural appropriation. Nourbese Philip (1993) suggests that at the heart of the ROM controversy are changing beliefs about the role and function of museums and other cultural institutions, especially the issue of who should have the power to represent and control images created by “others.” The traditional values and practices of institutions such as museums are difficult to change. One analyst poses an important question about the ROM controversy: Would the institution have supported a more critical approach to the subject? Would it have risked offending its important patrons, some of whom donated artifacts to the collection? (Butler, 1993:57).”(See the Colour of Democracy). 1990s There has been an exponential growth of the number of local museums and the expansion of large museums in the 1990s has been referred to as the big bang by former ICOM director Hugues de Varine. 1991 This is a performance art piece by poststructuralist artist. Her work is situated under institutional criticism. In it Andrea Fraser toured an exhibition of the work of contemporary artist Allan McCollum shown at the American Fine Arts Gallery in New York City. She presented the tour in two voices, her own and that of Ms. Jane Castleton), a fictional character, Fraser’s alter ego who was a museum volunteer docent with little understanding of modern art. 1991 Rabbi Michael Berenbaum was project director of the Holocaust Memorial Museum. Public awareness of the holocaust had heightened since 1978. Jewish suffering was once considered to be a footnote of WWII. This was changed and the horrendous crime was acknowledged. 1991 Ayanna Black (1991:27 in Creane cited in Barrett 2004) critiqued the Royal Ontario Museum’s infamous exhibition “Into the Heart of Africa.” She described the situation as follows, “They used the propaganda of the period without proper explanation or preamble. [The curator] did not want to manipulate the material, but she ended up implanting racist images because the critique of ‘intellectual arrogance’ did not come through. People missed it.” Cannizzo, a contract curator who had trained as a social and cultural anthropologist had done fieldwork experience in Sierra Leone misread her audience. 1991 Lee-Ann Martin submitted her commissioned report to the Canada Council entitled “The Politics of Inclusion and Exclusion: Contemporary Native Art and Public Art Museums in Canada.” It was the catalyst for the Visual Arts Section’s Acquisition Assistance Program (1996-9) offering monetary incentives to encourage Canada’s fifty-six public galleries to purchase contemporary art by Canada’s First Peoples (Jessup 2002:xxv). 1992 “In 1992, the British museum specialist Eilean Hooper-Greenhill observed that the museum as a historical institution had not received “any rigorous form of critical analysis.” Other scholars and critics chimed in around the same time.1 As it happened, a tidal wave of museum studies was just beginning to crest, many proclaiming critical agendas while complaining about their absence. The problem these days is how to navigate a flood of literature on the theory, practice, politics, and history of museums” (Starns 2005). 1992 Assembly of First Nations [AFN] and Canadian Museums Association [CMA], Task Force Report on Museums and First Peoples, Turning the Page: Forging New Partnerships Between Museums and First Peoples (Ottawa: 1992). 1994 The Heard Museum hosted a conference entitled “Navajo Weaving since the Sixties” attended by forty weavers and who presented detailed statements about their work. M’Closkey (2002:230-3) noted a sharp contrast between the presentations by the weavers and those made by dealers, museologists and textile experts who spoke of gallery aesthetics, the history of Navajo weaving and the quality of market-friendly rugs. Gloria Emerson of the Centre for Cultural Exchange at a New Mexico art institution commented on the chasm between the weavers and the scholars. She argued that the weavers should be generating the questions discussed at these conferences (M’Closkey 2002:233). 1994 Today “there are several reasons to stress the importance of local museums. At the same time we find big museums growing even bigger and observe an explosion in the number of small museums all over the world . The former ICOM director Hugues de Varine calls this a big-bang in the museum world, which makes it necessary to separate museums in two very different types: the process-museum and the institution-museum, the latter being the traditional museum” (Gjestrum 1994). 1994 The Metropolitan Museum in New York strategically aligned discount rental cars with their blockbuster exhibition of American Impressionism and Realism. The rental cars allowed visitors to visit places depicted in paintings in the exhibition. See Dobrzynski, J.H. 1994-05-09. “Impressionism Rides a Rental Car.” in Business Week:52-53. 1996 A conference organized by the Department of Ethnography of the British Museum entitled “Imagining the Arctic: The Native Photograph in Alaska, Canada and Greenland” was held in London, UK. Guest speakers included George Quviq Qulaut (Commissioner for Nunavut), Hugh Brody, Nelson Graburn, Elizabeth Edwards of Oxford’s Pit River Museum, Kesler Woodward, Alan R. Marcus who “explored the relationships between government policy and images of the Ahiarmut, as backdrop to the disastrous arctic relocations of the 1950s, Peter Geller presented hia paper on “Archibald Lang Fleming, first Anglican Bishop of the Arctic, as he disseminated a fascinating view of the “Eskimo” through his publications and lantern slide lectures; this was followed by a contemporary example of northern image-making, as Zebedee Nungak presented a series of slides documenting the recent political history of northern Quebec, as carried out by photographers for the Makivik Corporation of the Inuit of Nunavik.” See Peter Geller’s report. 1998 The first exhibition entitled “First Peoples, First Contacts” at the Museum of Man’s Gallery of North America at its new location at Bloomsbury opened. It was sponsored by the powerful Chase Manhattan Bank. The exhibition tells the story of the interaction of native Americans with the outsiders. The First Nations peoples represented in the Gallery are for the most part unfamiliar even to North Americans. They are represented as “half-forgotten, disgracefully patronised, different and enduringly fascinating peoples.” The story of curious Columbus is depicted without the usual overly romanticized sentiment. He is portrayed as the first of an onslaught of the “blatantly greedy and bigoted arrivistes, colonialists, sharks and expropriators.” Gallery of North America will feature rotating temporary exhibitions and will stay in situ for at least five years. See Henshall (1999) and J. C. H. King (1998 ) First Peoples, First Contacts, Museum of Mankind, London, UK: Chase Manhattan Gallery. 1999 Meanwhile, the museum was also being thoroughly absorbed by the markets and industries of culture under late capitalism.” See EndNote entry under Krauss (1999). 1999 Rosalind Krauss (1999) published a book entitled A Voyage on the North Sea criticizing art forms like his that had in her view, become fashionably vacuous, a shibboleth– installation art. “Krauss reflects that the notion of the specificity of medium as a foundation of the modern was shaken by Broodthaers ‘s practice and by the introduction of video technology in the 1960s. She anchors her historical narrative in the writing of Greenberg and Fried (in the latter’s reading of Maurice Merleau-Ponty) and in paintings by Jackson Pollock and Color Field painters, the sculptures of Richard Serra, and the structuralist films of Michael Snow, all of which registered a ‘new idea of aesthetic medium’ in new artistic conventions of opticality, which Krauss describes as foregrounding a ‘phenomenological vector’ in art that connects an object to a viewing subject. She forwards the notion that the construction of physical structure, even within the making of film, is constitutive of modern art: “For, in order to sustain artistic practice, a medium must be a supporting structure, generative of a set of conventions, some of which, in assuming the medium itself as their subject, will be wholly specific to it, thus producing an experience of their own necessity” (26). See EndNote entry under Krauss (1999). 2000 Izzie Asper became Canada’s new media lord as head of Canwest Global Communications. “After acquiring most of Hollinger’s newspapers and magazines, including half of the National Post, Asper now stands to be the most powerful figure in the history of Canadian media. A relentlessly tough businessman, he made a rather unexpected power play to dethrone Conrad Black and, although he might not be as grandiose about it, he now has more clout within Canada than Black ever did.” (Pundit Magazine). “Today, CanWest is one of Canada’s most profitable communication companies. In fiscal 2000 its net earnings were $162 million, with revenues totalling $1.08 billion and operating profits of $263 million. In July 2000, CanWest acquired most of Canada’s leading newspapers, as well as a 50 per cent stake in one of the country’s national dailies, The National Post. Earlier that month, federal regulators approved CanWest’s purchase of eight television stations, an acquisition that created Canada’s second-largest private television network under the banner of Global TV. Long before that, the corporation had forged an international broadcasting presence in New Zealand, Australia and Ireland” (Manitoba Government). Elsen, Albert. 1984. “Blockbusters : the pros and cons of the “blockbuster” art exhibition.” Art Museum Association of Australia. 18 p. (Occasional papers). Rosenfield, J.R. 1993. In the Mail: Museum Catalogues, Direct Marketing. November, pp 39-40. Watson, B. 1995-05-24. “Defending the Blockbuster.” Morning Herald. Sydney, AU. McLaughlin, Derina. 1998. “The blockbuster phenomenon: trends in Australia and overseas.” Australasian Science and Technology: Exhibitors Network. Focus on Issues. In his publication entitled Black Nova Scotians John N. Grant (1980:31) described how the Stag Hotel 1, an Inn located in Preston, was sometimes the terminus of Lt. Governor Joseph Howe’s carriage drives.” (p. 31.) Stag Hotel is a clever play on words as the proprietor was William Deer, an African Canadian. This inn is referred to at length in Manette’s thesis (1990) where she describes and quotes Mrs. Deer. It is also in Brown’s Illustrated History of Canada (Brown 1987: 287) but no mention is made of the fact that the owners were black. The book by John N. Grant entitled Black Nova Scotians was produced by Nova Scotia Communications and Information Centre and published by the Nova Scotia Museum as part of the Education Resource Service Program presenting the history of the Black Nova Scotians both as a people and as an important chapter in the history of Nova Scotia. It asserts the unique heritage of Black Nova Scotians. It traces the history from the arrival of the first Black Loyalists in 1793, the Refugees of the War of 1812 through the period of slavery examinging the role of education and religion. Grant underlines the fact that mainstream white educators overlooked the existence of black history. The Stag Hotel, was popular with Halifax sportsmen for its hunting and fishing. On May 28, 1873, Joseph Howe — ex-premier and new Lieutenant-Governor of the province — visited it for sentimental reasons. But the long drive was too much for his failing health, and he died three days later (Brown 1987: 287).”We inserted this image of a mid-19th century oil painting by an anonymous artist into a Google generated map of Preston, Nova Scotia. This image was uploaded from my Flickr account and is geotagged to a spot near the Black Cultural Centre in Cherrybrook, Nova Scotia. I am not sure of the exact location of the Stag Hotel in Preston although I know it is ten miles east of Dartmouth. Grant also included an illustration of the sign and the inn in his Black Nova Scotians. Grant, John N. 1980. Black Nova Scotians. Halifax. Nova Scotia Museum. Manette, J. A. 1990. Revelation, Revolution, or Both: Black Art as Cultural Politics. Toronto. Brown, Robert Craig, Ed. 1987. The Illustrated History of Canada. Toronto. Lester & Orpen Dennys Limited. CC Flynn-Burhoe, Maureen and Melanie G. H. 2008. “Popular 19th Century African Canadian-owned Stag Hotel and NS Premier Joseph Howe.” >> Google Docs.Uploaded by ocean.flynn on 23 Jan 08, 12.32PM MST. In the 1998 Anna Packwood’s family and friends came from across continents to celebrate her 100th birthday. This was the culmination of research on the Positive Presence of Absence: a history of the African Canadian community through works in the collection of the National Gallery of Canada. I can honestly say that of the ten years working at the NGC, this impromptu gathering — which almost did not happen because of security concerns over the large numbers and the last-minute arrangements — this was the high point of a decade of work there. The National Gallery of Canada now presents six images in their African Canadian section which the portrait bust of Tommy Simmons on their educational web site entitled Cybermuse. One of the catalysts for my research in the early 1990s was a conversation with Fritz Benjamin, a Haitian-Canadian who was working at that time as a security guard. He asked me who Tommy Simmons was, the man portrayed in the larger than life bronze bust prominently displayed in the water court. I didn’t know but once I started looking there were more questions about more works of art. After sharing my interests with Mairuth Sarsfield, author of No Crystal Stairs and her sister Lucille Vaughan-Cuevas they became my mentors. Lucille in particular spent hours with me clarifying histories. I eventually met other members of the Montreal community and wove various fragments together so I could present this walking tour to friends, then to fellow graduate students and finally to the public. It was a personal project that the Gallery promoted from 1995-1997 when they advertised it and offered it as a contract tour. The image is my first experiment in using Adobe Photoshop to create transparent .png images. 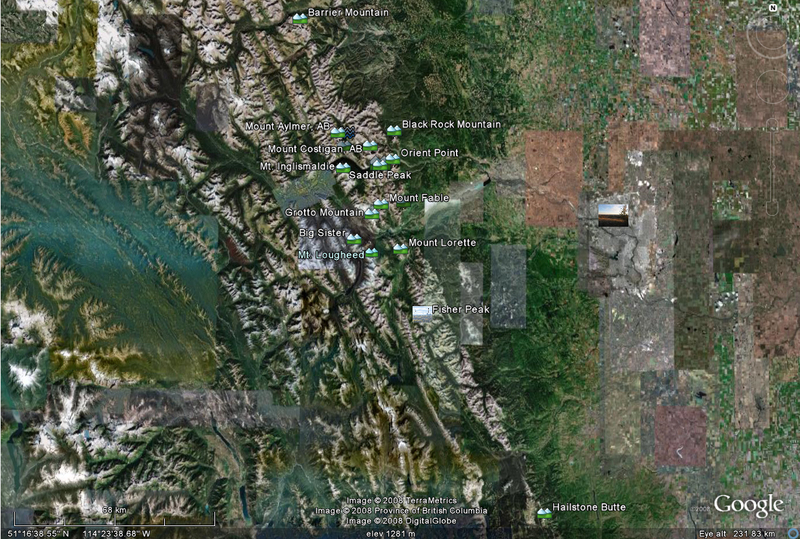 I needed to learn .png for my new Google Earth community. The Adobe Photoshop layers include Anna Packwood on the lower left, with a bronze of her daughter, Lucille Vaughan, an activist, educator and librarian. Beside them is Dr. Carrie Best, pioneer Nova Scotia journalist, activist and author. To the right of the water court is Jennifer Hodge Sarsfield, Anna Packwood’s granddaughter ,a pioneer in Canadian film narratology and beside her is the cover of Mairuth Sarsfield’s book entitled No Crystal Stairs, which was on the short list for Canada Reads filmmaker. A photograph taken in that part of Montreal Mairuth called ‘burgundy city’ shows Mairuth, Susan and Lucille, Anna Packwoods, daughters in the 1940? The collage of the family and friends from across the States, Canada and the Caribbean wasn’t large enough to include them all. I wrote this in a May 3, 1998 thank you note to NGC Education Division Director, Mary Ellen Herbert, CC: Judith Parker, Mairuth Sarsfield. After the luncheon celebration with Anne Packwood, about fifty of the invited guests came to the NGC. It was larger than anticipated but it was a huge success. Among the guests were Dr. Carrie Best, OC., Lucille Vaughan-Cuevas, Dominique Sarsfield, numerous friends of Anne Packwood from many different parts of Canada from Edmonton, Dartmouth, and of course, Montreal. There were guests from the United States and from Bermuda. The group included four or five elderly people in wheelchairs, a baby in a carriage, children of all ages. After a warm greeting under the Water Court we went to the Seminar Room. I showed about a dozen slides of the Picasso exhibition and a few of Orson Wheeler’s sculptures: Tommy Simmons and Lucille Vaughan-Cuevas. The group applauded warmly when they saw the bust of Lucille. Then we went to the Water Court to see Tommy Simmons. The discussion there is something I wish I had on tape. Many at first did not recognize the model by name or by the sculpted bust. But as we talked more and more people remembered something about him. One woman had babysat his children. Another played on teams that competed with his. Another told me of a Wheeler sculpture of an African Canadian model once owned by David? States. An artist from Detroit was excited by what could be done in galleries and plans on following up when she gets home. I invited Lucille to speak about her experience as Wheeler’s model for the 1950’s bust. It was captivating listening to her describe Wheeler’s special qualities as educator and artist. She had been particularly touched by his openness to Black history at that time. This experience was a highlight for me in my years at the NGC.